Love love love the black vanity in this custom Moroccan inspired bath in…California? International style travels elegantly to a Los Angeles home in the hills from designer Betsy Burnham. 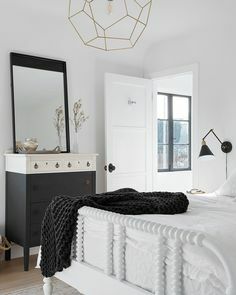 The black vanity with the star molding detail and white knobs and pulls, white quartz counter tops, the antiqued over sized mirror, simple sconces and a black and white tile floor equal perfection. Take a look and let me know what you think? What I love about this bath is that there are not that many elements. It is simple. The selection of the finishes and detail are well curated. Nice. What do you think of this black and white Moroccan inspired master bath?